Hopefully I will have some time to load reports, stories, feedback on trips and adventures. Please feel free to post your own about any type of human-powered mountain sports. Please feel free to send items for these sections to cam.walker@foe.org.au or by posting a comment in the relevant section. Tasmania. Check here for various trips in Tassie. Australian Alps Walking Track. Formerly called the Alpine Walking Track, the ‘Australian Alps Walking Track’ is a long route that passes through the mountains of Victoria and New South Wales. It is primarily a wilderness style walk as it passes through natural landscapes and there are no major facilities. The following are a series of notes from author John Chapman as well as a link to his book on walking the track. Australian Alps Walking Track – a great pictoral diary from John & Lyn Daly. The AAWT – notes from the Australian Alps website. Has some good details on planning trips, including doing sections of the overall route. Photodiary of a Nomad. “We are two not-quite grey nomads who have recently retired / changed careers / entered the third phase of our lives”. The Alps section contains a very detailed diary of walking sections of the AAWT. For a listing of mountain bike clubs in north east VIC check here. For maps for mountain bike riding in NE Vic check here. The climbing cyclist is a great guide to the best of the cycling climbs in Victoria. As you would expect, the Alps are well represented in the guide. I really like Bike Beyond, which is a great riding resource and also offers a tour program. Bike Snowies. Great resources on road and MTB riding in the Snowy Mountains. Big Ben’s Victoria. 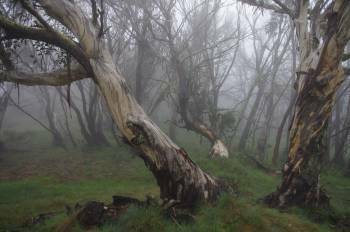 A series of notes and photos from walks in the Victorian Alps. Link to Open Spaces books, based in Melbourne, who produce a range of guides relevant to the Alps. Our hiking blog. Information about “bushwalking, hiking & backpacking”, mostly Vic and Tasmania. Put together by Frank and Sue, from Geelong, VIC. Also check the businesses section for commercial walking and riding operations. And the Blogs section of this site. Check out my blog from my AAWT trip earlier this year. Feel free to use it on your page. I MTBed first two weeks and walked last three. Mostly solo, with support along the way. thanks, looks like it was a great adventure – and some fantastic photos, too.